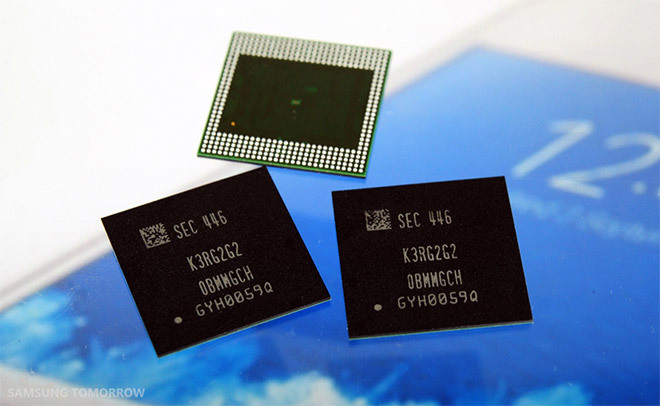 Samsung has commenced the mass production of its 20nm 4GB LPDDR4 mobile DRAM memory chips. Because of the 20nm manufacturing process, the new mobile LPDDR4 chips are reportedly 50% faster than the fastest LPDDR3 memory on the market, while also consuming 40% less power at 1.1 volts. The 4GB RAM chips will be ready to debut in smartphones and tablets in early 2015. The chances of the Samsung Galaxy S6 and Galaxy Note 5 rocking 4GB of RAM is quite high. It’ll be interesting to see what exactly he has in mind when talking about UHD, large-screen mobile devices. CES 2015 is our best bet to see what Joo Sun Choi has in mind.